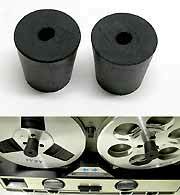 These rubber stoppers are used for the older type reel to reel recorders that do not have built-in tape reel locks. The rubber clamps onto the shafts of the deck to hold the tape reel in place for operating the reel to reel deck vetically. These rubber clamps are in excellent condition. As reel sizes are standard, these hold downs fit and work with almost any Reel to Reel deck, that requires rubber hold downs. I tested these on various decks such as: TEAC, SONY, Silvertone and more. A tape head demagnetizer is for all equipment that uses magnetic recording media. The playing of magnetized tape mamgnetizes heads over time and results in loss of high frequencies and hiss. Magnetized heads can also partially erase some apescts of the original recoding and thus may damage vintage recordings. Professionls use head demagnetizers about every 10 play hours to maintain full integrity of their equipment. Here is the needed tool - vintage all original from the good old days of analog recordings! Marc's Tech tip: Genrally a demagnetizer is only used for a couple of minutes each session to demagnetize tape heads and all metal elements in the tape path. When not in use, un plug it form power as no power switch. Connect or disconnect form power only when at least 6 feet away form tape heads as not to magnetize them with a power spike. Features: 117V AC with american AC plug. Note for all Reel Tapes: Due to weight actual shipping cost may be considerably higher than what the shopping cart automatically calculates, especially fo rorderign more than one tape, in which case I will send you an invoice via Paypal for the difference, which needs to be paid, before the item can ship - Or: Inquire and tell me how many tapes you need with your ZIP code before ordering and I will get you a shipping cost quote. Via US Postal Service media mail is the least expensive way. If wishing to have shipped with other services, please indicate. Description: I have one New Old Stock unopend shrinkwrapped TDK "Superior Quality Low Noise", Tpe: S-1200 Sound Recording Tape" 1.0 Mil Poliester Base, 370m (1200ft. ), Large diameter hub, 60 Minutes-both direction at 19cm/s(7 1/2" IPS). 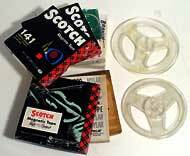 Description: These are vintage used 7" reels with 1/4" recording tape in cardboard box from various manufacturers, such as Ampex, Audio Magnetics, BASF, Concertape, Dunlap, General Electric, Memorex, Realistic, Scotch, Shamrock, Sony, Soundcraft, Sunset, etc. Each tape has been played briefly in my deck, tested to not squeak and not to be brittle. Other than that: sold "As-Is" without any guarantee or warrantees of any kind, due to age! Condition: Used, tested - as described above. Sold "AS-IS". May have some good vintage 50's, 60's and 70's music or other recordings on it ! Lot: 1 each, 7" Used magnetic recording tape on reel (most reels are clear) with box. Condition: Works great. Great Physical Condition. Appearance and physical condition may varry, but definitely will be good. These are getting harder and harder to find these days - get them while still available. Empty 5" Tape Reels: below! 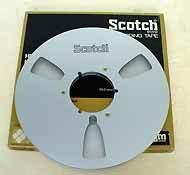 Description: These are vintage used 5" full reels of 1/4" recording tape from various manufacturers, such as Concertape, Scotch, etc. Each tape has been played in my deck, tested to not squeak and not to be brittle. Other than that: sold "As-Is" without any guarantee or warrantees of any kind, due to age! Condition: Used, tested - as described above. Sold "AS-IS". May have some good vintage 50's, 60's and 70's music on it. Lot: 1 each, 5" Used magnetic recording tape on reel (most reels are clear) with box, when one is availablee (95% have boxes, about 7 tapes are currently in stock).  Super Saving Special Sale! 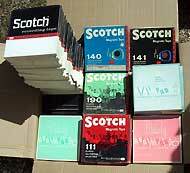 These are original vintage new old stock 8 track blank cartridges in original unopened shrink-wrap / packing. While new please consider that the effects of age cannot be stopped. They may or may not work.. Sold "AS-IS" in original packing. 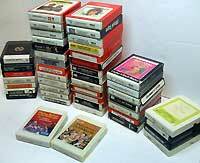 These are original vintage used 8 track tape deck servicing cartridges. These are used and show signes of use - I am unsure how much life is left in them. They may or may not work - buy for collecting purposes. Sold "AS-IS"
Thiese vintage 8-Track player / recorder head cleaning cartridges are labelled as: " Non Abrasive 8 Track tape head cleaning cartridge" - Clean Tape cartrige payer heads the easy way... Cleans and polishes.... Instructions printed on each... Cautions: Don't leave cleaning cartridge running for exteneded time." Very appropriate, as most heads are difficult to reach to clean otherwise and as 8 Track tapes are getting old highly recommneded to keep your player's heads clean and in good shape. Photo: Left: M-Track 8 Track Head Cleaning Cartridge "Non-Abrasive" Used, shows signs of use Sold "AS-IS"
Photo: Center: PickWick 8 Track Head Cleaning Cartridge "Non-Abrasive" Used, shows signs of use Sold "AS-IS"
Photo: Right: Memorex 8 Track Head Cleaning + Capstan cleaning Cartridge, 2 sided: One for head cleaning the other for Capstan cleaning, with Instructions, Used, shows signs of use Sold "AS-IS"
Only 1 Memorex 8 track head/capstan cleaning cartridge available and when sold, it is gone!  Inquire / Buy  Secure and Easy Payment through Paypal. Lot: All 11 records for $55, or $6.00 ea. - Payment Link will be removed when item sold! Factory Pre Recorded Vintage 7" Open Reel Music Tapes - Originals!  15% Discount for 5 or more tapes, 25% Discount for 10 or more tapes, 50% discount for 20 or more tapes. 1) Verdi - Othello - Vickers / Rysanek / Gobbi / Sarafin, RCA FTC-8004 Red Seal -, 2 reel tapes and box, excellent condition. 2) Verdi - Il Trovatore - Price / Elias / Tucker / Warren / Tozzi , 7 1/2 IPS, RCA FTC-8000 Red Seal , 2 reel tapes and box, good to excellent condition. 4) Gilbert & Sulivan - Iolanthe - Complete, New Symphony Orchestra of London, 7 1/2 IPS, London LOS 90046 -, 2 reel tapes and box, good to excellent condition. 5) Verdi - Aida - Herbert Von Karajahn - Vienna Philharmonic Orchestra, London LOR 90015 -, 2 reel tapes, booklet and box, good to excellent condition. 9) Tchaikowsky - Symphony No.7 - The Philadelphia Orchestra - Eugene Ormandy - World Premiere Recording, Columbia MQ472, reel tape, 1 page pamphlet and box, excellent condition. 13) Schubert - The "Trout" Quintet - Clifford Curzon + Memebers of Vienna Octet, 7 1/2 IPS, London ICL 80092, reel tape and box, in excellent condition..
16) Show Boat - Jerome Kern, with John Raitt, CBS OQ487, 7 1/2 IPS, reel tape and box, in good to excellent condition. 23) The Dukes Of Dixieland - Now hear this... - Columbia CQ465, reel tape and box with pritned insides ( 2 pages), in good to excellent condition. 24) Lionel Hampton - Hamp's Big Band - Recorded 1960, Audio Fidelity AFST 1913, reel tape and golden box , in excellent condition, recorded @ 7 1/2 IPS in quarter track fromat - plays on any modern reel to reel deck. 26) Freddy Martin - Rhythms From Latin America - 7" Record Singles Album (NOT reel to reel tape! ), 3 x 7" 45 RPM records and box, in good condition - RCA Victor WP213. 27) Glenn Miller - A Musical Memory - 3 3/4 IPS 2 Track, Omegatape MTF 3-1063 reel tape box, in good to excellent condition. 29) Willie Alunuai - Holiday on those Magical Islands of Hawaii - 7 1/2 IPS 4 Track , Viking VK3, reel tape box, in good to excellent condition. 30) Ferrante and Teicher - Latin american Adventures - 7 1/2 IPS 4 Track , Royality R2024, reel tape box, in good to excellent condition. 31) Hal Mooney - Flutes And Percussion - Series 2000 - 7 1/2 IPS 4 Track , Stereo Time ST 2001, reel tape box, details printed inside, in good to excellent condition. 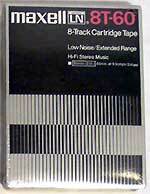 32) Henry Busse - A Tribute to, 7 1/2 IPS 2 channel - stacked heads , StereoTape 13, reel tape, 12 page poster pamphlet about StereoTape, box,, in good to excellent condition. 33) Torero Ole - "Spine Tingling Music and Marches of the Bull Ring in Wide Angle Stereo" - La Orquestra de la Plaza de Toros de Madrid - - 7 1/2 IPS 4 Track , Avon R-2057, reel tape and box,, in good to excellent condition. 34) Ted Wheem - Volume 1 - 7 1/2 IPS 4 Track Stereo , OmegaTape STF7-824, reel tape and box,, in good to excellent condition. 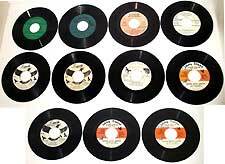 40) Leonard Sorking Strings - Favorite show tunes - volume 1 +2 - 7 1/2 IPS, 2chanel Stereo High Fidelity Recordings On Tape, concertapes 22-2 + 22-6, 2 reel tapes, each in round plastic box (2 boxes), in good condition. Inquire for more info if needed. 7" Reel Tape, NO PHOTO (!) Tenessee Ernie Ford - Faith Of Our Fathers; Tracks: Break Though the Bread Of Life - Jesus I come - He Alone Can Save Me - AND Others; 3 3/4 IPS, 4 Track - STEREO; Capitol Full Dimensional Stereo Y1T 2761, , Printed in USA, original tape, reel and box, good to excellent condition. 7" Reel tapes, NO PHOTO (!) ( Set of 4 tapes) Rev. R. B. Thieme, Jr. Pastor, Beracah Chrch - Doctrinal Bible Studies - 1970 - Dan 2:1, 2:13-34 - The content of Nebs Dream - Daniel 5:13-31, Daniel 6:1-10, Daniel, 6:15-28, Titus 1:9-14, titus 1:15-16 Doctrine Of Conscience; Daniel 7:1 rise and Fall of Nations - Intro to, Daniel 7 Jer. 50; 51; Deut 32:1-8, Daniel 7:1-7, 4 tapes, reels and boxes, good to excellent condition. NO PHOTO (!)) FRENCH LANGUAGE LEARNING TAPE - Heath - Foreign Language Learning Tape - Parlez Vous Francais? Second Edition; 3 3/4 IPS, 4 Track - MONO; ©1961 Heath and Company, Printed in USA, original tape, reel and box, good to excellent condition. 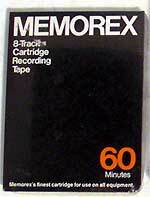 Music Factory Pre-Recorded on Tape cartridges in 8 Track Cartridge format. Only 1 tape available each - and when sold it's gone! --> Please copy and paste the titles you wish to order when checking out !!! Or I will have to e-mail you and wait for your response before I can ship. 41) Abba - Voulez Vous, Atlantic 1R1 7024, reel tape (3 3/4 IPS) and box good condition. 50) Eagles - Greatest Hits VOLUME 2 (3 3/4 IPS), Asylum 1R1 7486, reel tape and box, excellent condition. 64) Lainie Kazan - Right Now (3 3/4 IPS), MGM STX 4340, reel tape and box, good to excellent condition. 76) The New Seekers - We'd Like to Teach The World to Sing (3 3/4 IPS) Electra EST 74115-B, reel tape and box, excellent condition. 77) Queen - Greatest Hits (3 3/4 IPS) Electra 1R1 7326, reel tape and box, good to excellent condition. 78) Kenny Rogers - Greatest Hits (3 3/4 IPS) Electra 1R1 501072, reel tape and box, good to excellent condition. 95) Dionne Warwick - Dionne Warwick's Golden Hits - Part 1 (3 3/4 IPS) Scepter Records 19-565-F, reel tape and box, excellent condition. 98) The Sound Of Music - An Orginal Soundtrack Recording (3 3/4 IPS) RCA TO3 1019, reel tape and box, good to excellent condition. 102) Marvin Hamlin - The Entertainer (3 3/4 IPS) MCA MCAS-2115, reel tape and box, excellent condition. 105) The Well Tempered Synthesizer - Walter Carlos on MOOG SYNTHESIZER -Virtuoso Performances of Bach, Monteverdi, Scarlatti, Händel - Trans Electronic Music Productions (7 1/2 IPS) Columbia Stereo Tape MQ 1150, reel tape and box, good condition. 106) Ray Coniff - Ray Coniff's Greatest Hits (3 3/4 IPS) Columbia Stereo Tape HC 1154, reel tape and box, good condition - some wear on box, tape excellent. Montevani Option: Purchase all of above 7 Montevani Tapes: # 124, 125, 126, 127, 128, 129, 130. Pay $35 instead of $70! 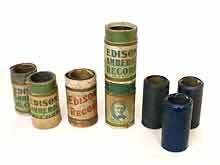 Edison Amberol-Records - Music Cylinders. More than 100 years old! Here is an antique relic original from the beginning days of sound recordings! Edison invented the phongraph and cylindrical records were the first recrods to appear at the turn of the cnetury. These records have survived time and are from the inventor's factory and "record label". Cylinder Records have grooves on the surface of the cylinder. Only 1 cylinder each available and when sold it's gone - A historical Chance of a life time! (Will remove lisiting entries as they sell) Secure and Easy Payment through Paypal. My work aimes for highest quality. I charge: - by the hour, - by a special dicount rate per day, if your project takes more than a day of work time, - at a further discounted rate, if your project takes more than 3 days. I also sell refurbished quality reel to reel decks. I offer transfer, restoration, enhancement and post processing services. I process orders only under the agreemnt, that you are in possession of all legal licenses to copy copyrighted materials and that you take full responsibility for any claims that may arise from potential copy right violations.  What does it take transfer Reel to Reel tape to CD or MP3? As tape reels vary in sizes and can be recorded in various diferent formats and recording speeds, a definte estimate can only be given when all details in regards to formats and the recorded material a tape contains, are known (Detail below). Rule of thumb: If wishing to receive CDs (or MP3s) where each tune / piece from a tape can be accessed as a separate track on a CD, an average work/transfer time double of the material length (or: play time can) be expected. In other words: Required transfer work time averages aproximately double the PLAY TIME of the material recorded on your tapes.  How do I estimate PLAY TIME (or material length) of my open reel tapes? Guideline: One 7" Open Reel Tape contains about 1800' of tape and will play in stereo: 45 Minutes @ 7 1/2 IPS, 90 Min. @ 3 3/4 IPS or 180 Minutes @ 1 7/8 IPS, PER SIDE (!) - so double the time if recorded double sided; AND: if recorded in mono: (as there are 2 tracks per side for quater track width) double the time AGAIN!. 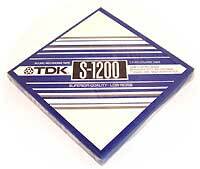 - Tapes that have little material on them or have few separate tunes / pieces requiring no- or little separation. - sound quality poor or varies (may add considerably to the time it takes to process, as each change requires time to readjust processing). - Tunes merge into each other; talk over the beginning or ending of materials etc. - Poor quality tape materials: aged tapes that are brittle, have loose tape partices, are torn, have wrinkles, are tearing apart easily, or a chemically contaminated, were storred in poor environments, etc.  What do you need form me to give an estimate for transfers of my materials? - Material on the tape. A suitable Reel to Reel Tape Deck in great working condition (there are many formats and tape sizes - see above! ), Possibly analog processing equipment, and digital recording equipment that ideally would have processng capabilities and outputs to standard audio CDs (MP3s). This is one NOS 2 Pack TDK SA-90 Cassette in unopened shrink wrap packing from the 90's. 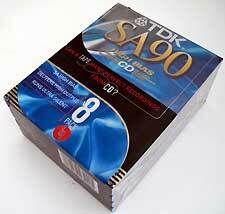 This is one each NOS 8 Pack TDK SA-90 Cassette in unopened shrink wrap packing from the 90's. Each tape in 8 pack individually wrapped in addition. 8 TKD SA casstte tapes = 8 pack. 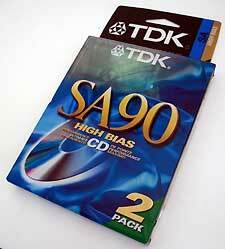 This is one each NOS TDK SA-90 Cassette in unopened shrink wrap packing from the 90's. 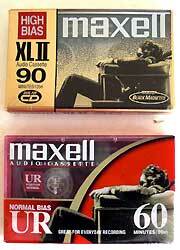 I have 3 NOS Maxell XL-II Hi Bias and one UR Low bias Cassette Tapes in unopened shrink wrap packing from the 90's. 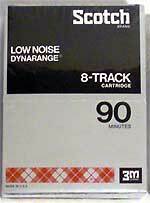 I have 27 (total) NOS Maxell XL-II-S 90 Minute Hi Bias Cassette Tapes in unopened shrink wrap packing from the 90's. I have 2 12 Packs NOS Maxell XL-II-S 90 Minute Hi Bias Cassette Tapes in unopened shrink wrap packing from the 90's. 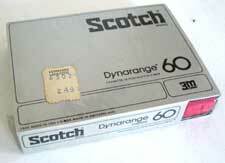 This is a NOS Scotch Dynarange 60 Minute Cassette in original unopened shrink wrap packing from the 70's. This is a NOS TDK Sound Master Cassette in unopened shrink wrap packing that I bought new in the 90's.